Since you out there in Blog Land are such advanced and intelligent vegans, I'm sure you thought of this long before I did... but in the last 6 months or so, I've started saving all my veggie scraps in the freezer. 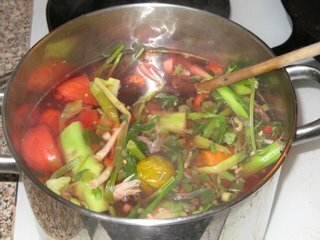 Then, when the bag gets full enough, I toss it all in the pot and make some yummy veggie broth. It's a great system! 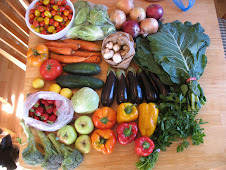 Also, since we don't compost, it gives me something worthwhile to do with my peelings and stems and such. 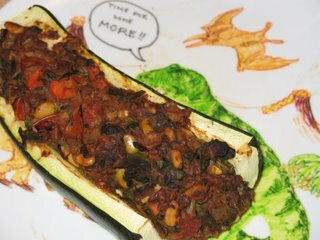 Tonight's dinner was the stuffed zucchini halves I made two nights ago with the giant zucchini from our neighbor. It was pretty tasty, but even after cooking at 400 degrees for a LONG time, the zuke was pretty tough. I guess they're not so tasty when they get that huge. Today I also made a lot of jam. We are preparing for a big trip coming up in about 10 days, and I wanted to clean out our freezer a bit ... so that our cool housesitters would stand a chance of getting a pint of ice cream in there! My grandparents grow raspberries... so I tend to store up a lot of raspberries. 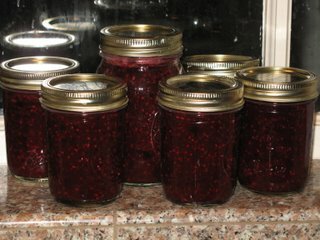 I made 6 jars of raspberry jam and another 6 jars of raspberry-blackberry jam. I've got a huge bowl of defrosted blackberries in the fridge now... Any ideas what I should do with them? ?